Jacob Hubler, an immigrant from Switzerland, purchased his first tract of land in what is now Bushkill Township in 1743 and over the next decades he would continue to accumulate tracts of land that he would later call Jacobsburg. Hubler became a naturalized subject of the British Crown in 1763, and during the American Revolution he served on Northampton County’s Committee of Observation. Sometime before 1785, Hubler built the Jacobsburg Inn, which served as a store, tavern, and residence. By the time he died in 1789, Hubler’s holdings amounted to about 432 acres. 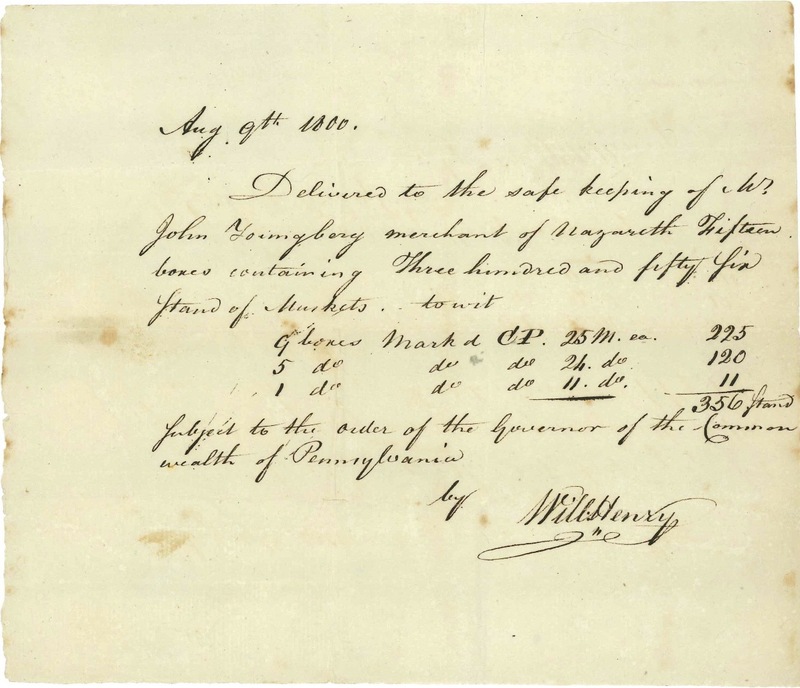 In 1790, some men from Nazareth — including William Henry II (1757-1821) — began to purchase the Jacobsburg land from Hubler’s executors, as well as some adjoining land from the Commonwealth of Pennsylvania and other neighbors. By 1796, Henry had obtained exclusive property rights over nearly all the Jacobsburg tract as well as about 165 additional acres. Henry continued to purchase land and enlarge the Jacobsburg tract for the next decade and a half, although twenty-six acres on which the Jacobsburg Inn itself stood passed into the hands of Nathaniel Michler. 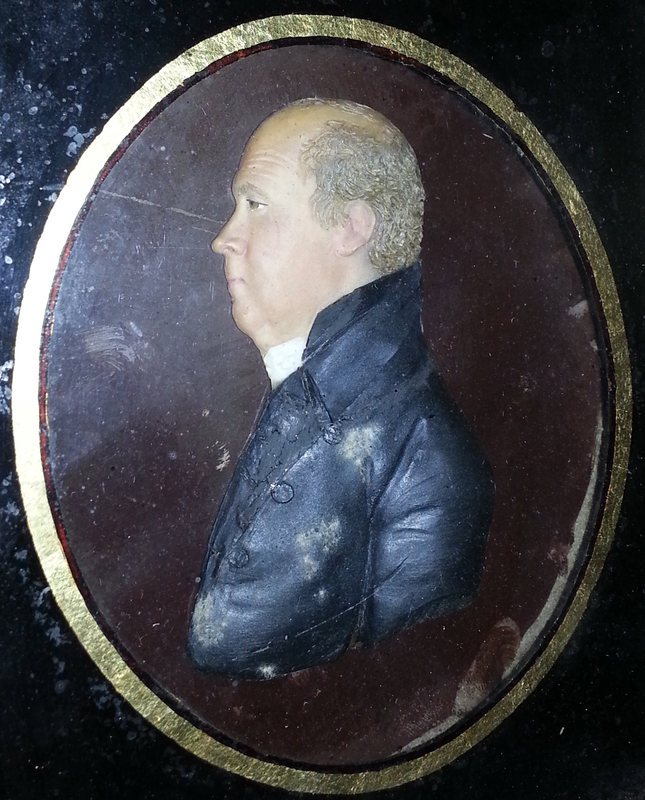 Michler, a justice of the peace, retained the property until 1822, but after 1809 he leased the inn and the store to others — including to John Frederick Wolle (1785-1860) and Sabina Henry Wolle (1792-1859), Henry’s son-in-law and daughter. The Wolles ran the Jacobsburg store (and, it seems, the Inn) from 1809-1818. William Henry II traced his roots to Lancaster, PA, where William Henry I (1729-1786) apprenticed as a gunsmith and later became a successful merchant and important patriot during the Revolutionary War. In 1780 William Henry II settled in Nazareth, after learning the gun trade in the Moravian communities of Lititz and Christian’s Spring, and he worked in Nazareth as a gunsmith and joiner. He continued his Nazareth operations during the years he was purchasing the Jacobsburg tracts. 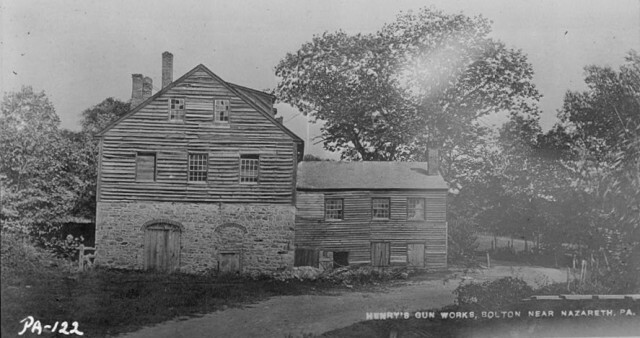 It was only in 1798 that Henry built a gunworks at Jacobsburg on the Bushkill in order to fulfill a large government arms contract. The contract complete by 1803, Henry converted this gunworks into a gristmill and a sawmill. A decade later two of his sons built and then operated the Boulton Gun Works, which produced a variety of arms for nearly one hundred years. It is likely they called their operations “Boulton” after Matthew Boulton, an English industrialist who had died in 1809. Mary Henry Stites (1907-1989) and William Henry Atherton (1929-2011) were the last Henry family members to live at Boulton. We hope our Henry family genealogy — which, like all genealogies, records some branches of the family in greater detail than others — will aid researchers in the Jacobsburg Historical Society Archives.